WADA YA KNOW? Fake story, fake accusation as I said at the time “My default position nowadays is that it’s all lies.” NYT reports that WADA has cleared 95 of the 96 athletes they looked at. But that propaganda outlet cannot resist suggesting that that Russia may have destroyed the evidence. That’s the information war: smear the unfounded charge all over; when the story collapses and the damage done, move on to the next one. What we did learn however, is that a remarkable number of Western athletes have a doctor’s note that allows them to take banned substances. Interesting eh? MOSCOW ELECTIONS. While the pedestal party won overall, there was some excitement because, in a very low turnout, “liberals” organised a win in some seats in Moscow. Karlin is not impressed and points out the correlation with bicycle rental stations. Shamir takes it more seriously seeing it as the latest Washington regime change effort. Perhaps he’s right: both The Guardian and Newsweek hail it (BTW: the comment by Germann Arlington absolutely nails the Big Inconsistency of Western reporting: “If the elections are rigged then the result should have been the usual 98% for Putin’s party. If the election is not rigged then why is it always presented as such?”). Russian politics are pretty frowsty: the pedestal party dominates (but the Putin Team is popular) the KPRF and LDPR were led by the same guys when the USSR was still around, even Yavlinskiy (then, now) is still out there (Crimea is part of Ukraine: not a big vote getter). One day things will start to change but I doubt this is the moment. LISTENING IN. Wikileaks tells us about Russian scanning of electronic communications. Putin often tells us that everything is done legally. Well, it always starts that way, doesn’t it? If they can, they will. SAUDI-RUSSIA VISIT. My take on Salman bin Abdulaziz’ visit to Moscow. I remember that Abdulaziz switched from London to Washington in 1945 and speculate that Riyadh may again be adjusting its place in the developing new power order. STALIN’S NOT BACK. Robinson describes a visit to a church dedicated to the New Martyrs situated on a Cheka killing ground. The truth is that Russia remembers everything. SANCTIONS. According to the UN rapporteur, sanctions and counter-sanctions cost the EU US$3.2 billion a month; the Russian economy has lost US$55 billion in total. He calculates the total cost to both at US$155 billion. In short, he agrees that Europe has been hit much harder than Russia and certainly much more than the USA. Perhaps that was the real point: Washington’s “overriding strategic objective the prevention of a German-Russian alliance“. RUSSIANS IN SYRIA. The author has sent me a file of photos which are of interest. What is immediately apparent (I can’t help comparing them with what I saw during Chechnya I) is the aura of tough professional competence and lots of sophisticated kit. S-400. Turkish President Erdoğan says Ankara has already put down a deposit on the S-400 SAM system. I am still rather puzzled: this is a crown jewel weapon system and Turkey is, still, in NATO. We are assured that this is just the export model and that even taking it apart wouldn’t reveal its secrets. TRUST. Trump announced the closure of the CIA support to Syrian rebels. Or has it ended, or was that just weasel-wording that allowed the Pentagon to continue? Who can say? Foreign Affairs magazine, no less, has just gone public with “The Pentagon Is Spending $2 Billion Running Soviet-Era Guns to Syrian Rebels” and there are persistent reports (denied by Washington of course) that US helicopters lifted people out of Deir ez-Zor after the Syrians broke the siege. (Deir ez Zor was the scene of the US attack on Syrian forces a year ago.) Trump’s constant references to the Iran nuclear deal as “one of the worst” does not give anyone confidence that Washington would keep its word to Pyongyang (or anybody). AMERICA-HYSTERICA. All the reasons why the Russia-election-interference story is bunkum. Not least of which is the remarkable inactivity of the FBI: for example “The FBI has never questioned Assange [he confirms that] or Murray” and neither has it ever looked at the DNC servers. Nonetheless, every time you think the hysteria has gone as far as it can, it goes a bit farther: Morgan Freeman joins the circus. Bershidsky trashes the latest nonsense. One can hope that it’s finally jumped the shark. DIPLOMATIC PROPERTY. A complete violation of the Vienna Convention: “Article 22. The premises of a diplomatic mission… are inviolable… The host country must never search the premises…”. Washington has set a precedent that will come back to bite it: what’s to stop any country that thinks it’s on Washington’s target list from doing the same? Incredible. Who’s in charge? BRIDGE. The Kerch Strait bridge rolls along. Here’s the railway arch being moved into position and the first ship passing under it. Here’s an amusingly one-sided account of things from the Daily Signal. ZAPAD 2017. NATO is giving itself a major case of the fantods over this exercise “close to its borders”. The website so you can follow yourself: 14-20 September in Russia and Belarus, 13K troops, 70 aircraft, 250 tanks, 200 guns and 10 warships. “Anti-terrorist” of course – aren’t they all these days? – “The exercise stipulates that some extremist groups have penetrated… “. They have them every four years. QUAGMIRES. Shortly after Moscow began its intervention in Syria, Obama opined “An attempt by Russia and Iran to prop up Assad and try to pacify the population is just going to get them stuck in a quagmire and it won’t work“. Well, yesterday Damascus broke the seige of Deir ez-Zor which probably marks the beginning of the mopping up phase. In short it’s not a quagmire and it did work. 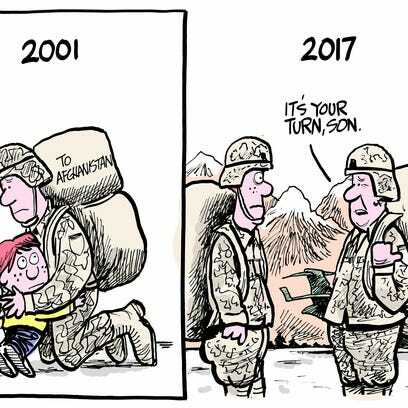 The US involvement in Afghanistan, on the other hand, is about to enter year 17, getting on for twice as long as the Soviets were there. That is a quagmire and that hasn‘t worked; the Pentagon isn’t even sure how many soldiers it has there: 8.4K, 11K or more? Russia has had three military actions this century – Chechnya II, Ossetia and Syria – all victories; all US military interventions have been failures. What’s the difference? I would suggest that Russia initiates military violence with a clear plan 1) to do only what violence can do 2) that is integrated with a diplomatic and civil program for the things it can’t and 3) coordinated with reliable allies on the ground. When it has done what it set out to do, it stops. Washington, on the other hand, 1) expands its aims after the initial success far past those that violence can achieve 2) has a negligible diplomatic effort and 3) its allies on the ground turn out to be phantasms of the Washington echo chamber. Added to which, I do not believe that the US military is nearly as competent as its cheerleaders think it is; I suspect it resembles the post-Vietnam mess I saw on exercises in Germany in the 1980s. Maybe even “hardwired for failure“. ISRAEL. Jerusalem seems to have understood its defeat sooner than Washington. Iran has a much stronger presence in Lebanon, Syria and Iraq thanks to two decades of calamitous interventions. It is argued here and here that a nervous Netanyahu received a dusty answer from Putin in Sochi: Iran is Russia’s “strategic ally in the Middle East”. BRICS. The summit communiqué is rather blah except for 10 and 11 which deal with finance and currencies. There’s a story that China “is preparing to launch a crude oil futures contract denominated in Chinese yuan and convertible into gold“. This would be a strong blow to the power of the US dollar and, by extension, of Washington itself. When Kennan warned against the “superficial and ill informed” decision to expand NATO I don’t think he foresaw all the downstream consequences. Beijing, famous for long-term thinking, took a warning from it too. Newton’s Third Law of geopolitics. OOPS! It will be at least 2024 before the US can replace the Russian rocket motors. Carefully excluded from Congress’ sanctions bill of course. KOREA. Has there been much mention in your local news outlet of the US-South Korea exercises of 21-31 August which, they say, sometimes include practising “decapitation strikes”? (The media often leaves out important synchronicities.) I’ve heard that North and South will meet in St Petersburg. We shall see; there is a solution to the problem: what Beijing calls “double suspension“. And it probably doesn’t require Washington: Seoul could agree to stop the exercises and tell some of the 35K+ US troops to leave. Putin has strongly condemned Pyongyang’s tests: “a flagrant violation“.